If there is one thing you know about improv, it is probably the “yes, and…” philosophy. As I come to more fully understand it, I seek to apply it to my everyday life. It was pretty awkward. No one talks like that in real life or on the improv stage, but it illustrated the value of “yes and” thinking in improv. 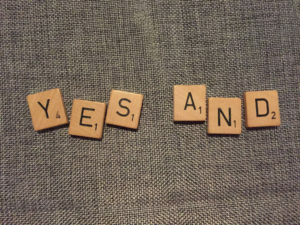 “Yes, and” is one of the guiding principles of improv. Photo by Joe Iovino. 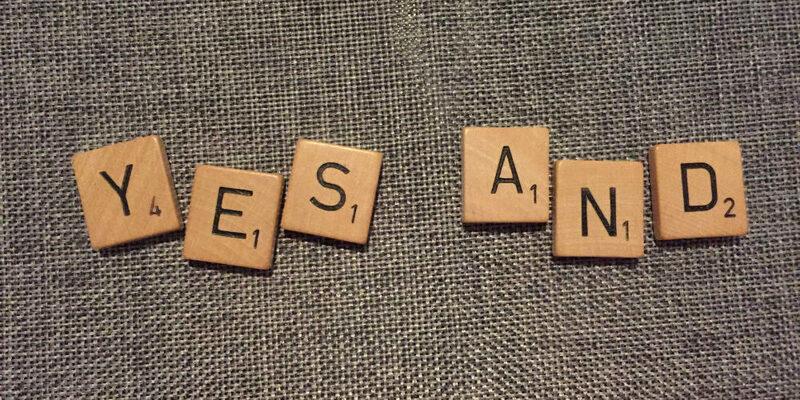 The yes accepts the premise of the other actor(s). Deborah took all the paper clips and it’s a problem. Had I broken the rule and responded, “No. Here they are!” my no would have killed the scene. Instead, I accept what my scene partner offers and the scene continues. The and indicates that I am expected to add to the scene. If I respond to the paper clip dilemma with, “Yes, that’s terrible,” the conversation stalls because I didn’t contribute anything. We’re still talking about paper clips and that’s boring. The conversation shifts on the and—from paper clips to reports, job security, vacations, and finally life-changing experiences. Now we’re onto something interesting. Notice this doesn’t happen all at once. Technically, I followed the rule, but it doesn’t work. The life-changing experience isn’t an addition to the scene, but a replacement—as good as a “no.” Again, the conversation is shut down. (We’ll talk about another tool, “bring a brick not a cathedral” in another post). Following “yes, and…” the actors get to the life-changing experience together by allowing the scene to develop. Neither guides the conversation to a predetermined end. They work, explore, and learn together, trusting it will lead them someplace interesting. One of the important lessons I learned in my seminary clinical pastoral education (CPE) unit was to “start where the other is.” As a hospital chaplain, I often visited people whose religion and/or theology was very different from mine. My role, I was taught, is not to ‘fix’ their ideas about God, but to find where God is at work in their lives and begin there. That sounds like a “yes, and…” technique for pastoral care. A caveat: This does not mean that you sanctify bad theology. You simply start there. Applied beyond the improv stage and pastoral care, “yes, and…” can change all of our interactions with others. When meeting one with whom we disagree about politics, religion, or even a movie, the fastest way to shut down the conversation is to start with “no.” No, you’re biased. No, you’re wrong. No, you don’t know what I know. Instead, say “yes, and…” Accept the person where they are, then add to the conversation. When done well, a conversation about paper clips may transform into a life-changing experience for both of you.